This is the cover of Convert. When you see it, take out your wallet. 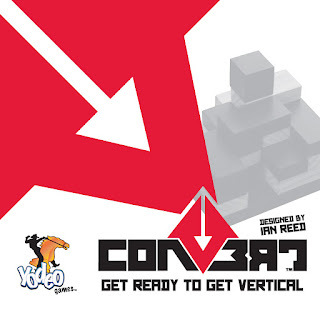 I first played Convert with Ian himself at Dreamation last February. The Yodeo Games table was a few down from mine, and during a lull, I figured I'd check it out. I played (a game takes about ten minutes, even with teaching, which takes about two), took out my wallet, bought a copy, and played two more games immediately. Convert is that good. The ratings on BGG don't lie. I normally don't include rules in my reviews - but since this will take me three sentences, I might as well. 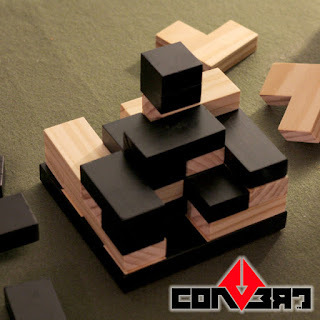 There are variously-shaped blocks in the box, half black and half white. They're placed on a 4x4 checkerboard platform, and as players move through the game, they score one point for each row "converted" to their color. Once all players have either placed all of their blocks - or when no one can play any of their blocks - players count up the number of spaces controlled by a color from a bird's eye view and adds one point for each to their score. As an abstract game, too, there's a lot of room for variants to Convert, which Ian releases each month on his website. July's variant scores at the end not based on the bird's eye view but by seeing who has more of their color on each of the 12 edge spaces when viewed from the side. June's variant requires players to place only on the first four levels; the player to place a piece on the fifth level of the board (or who cannot place a piece) loses. Convert is a game that I'll be playing for years and years to come, and I suspect that you will, too. It's the best game that I've played so far this year.